The architect of The Australian Holy Wars is a bluntly spoken, highly intelligent, intuitive newspaperman who adores Rupert Murdoch, despises the soft-left pretentiousness of rivals Fairfax and the ABC, and loves ink on paper. 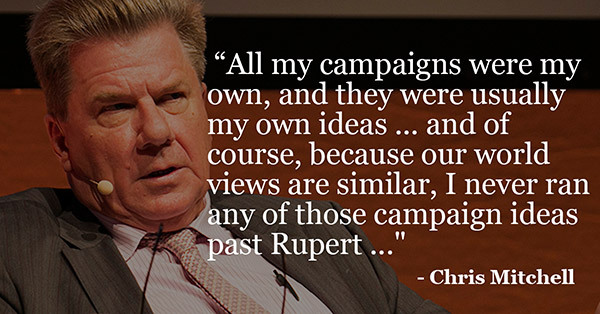 In 2002, when he became The Australian‘s editor-in-chief, Chris Mitchell harnessed all those passions to create what he describes as a “campaigning” newspaper — and, in the process, changed the ethical framework of Australian journalism forever. If you believe Mitchell, The Australian became a vehicle for personalised, nasty, biased, often vicious campaigns against a whole cast of individuals because it believes in “a set of values”. (And maybe, along the way, to get noticed and talked about?). Mitchell’s justification for The Australian becoming effectively a newspaper of Holy Wars is that he wanted it to stand for something (unlike, he says, The Guardian and the Fairfax papers). In the eyes of their creator, the Holy Wars are a brilliant confirmation that The Australian has a set of values that makes it one of the great newspapers of the world.